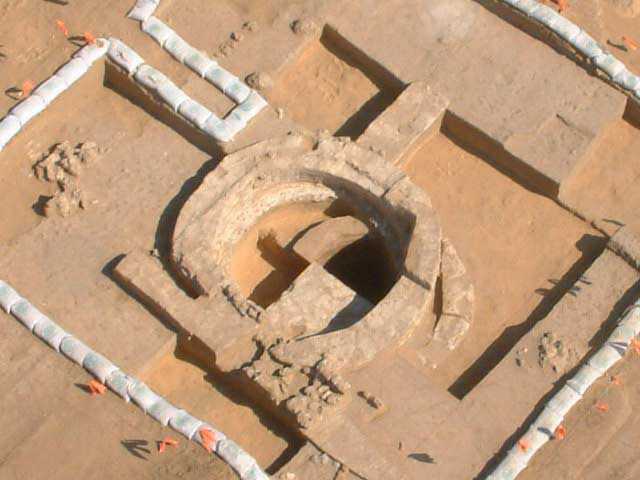 During June–July 2004, a trial excavation was conducted at Ashqelon Barne‘a B–C, adjacent to the coastline and north of the present-day city (Permit No. A-4177; map ref. NIG 15975/62300; OIG 10975/12300). The excavation was carried out along the path of the projected roadways in a future neighborhood, at the request and with the funding of the developing contractor, the Economic Company for the Development of Ashqelon. The excavations, on behalf of the Antiquities Authority, were directed by A. Golani, with the assistance of N.S. Paran, S. Talis and A. Kruchmelnik (area supervision), H. Lavi, Y. Haimi and E. Alajim (administration), V. Essman and V. Pirsky (surveying), T. Sagiv and J. Kdoshim (photography), Y. Bukengolts (pottery restoration), Y. Nagar (physical anthropology), N. Zak and I. Berin (drafting) and P. Nahshoni (district archaeologist). Large-scale earthmoving activities in this region were first carried out 40 years ago, when roadways were installed and then again, during 2003, when this infrastructure was dismantled, removing most of the sand dunes that overlay the site. These dunes bore remains of a Byzantine (fifth–sixth centuries CE) occupation, partially excavated in the past. The earthmoving operations damaged the site, yet also exposed large areas of an occupation associated with a very early stage of the Early Bronze Age I period. This settlement is located approximately 1 km north of the EB site at Ashqelon Afridar (see ‘Atiqot 45). Prior to the excavation, ancient building remains of stone and mud-brick walls were observed upon surface. A survey defined the area of the EB site as encompassing approximately 55 dunam, positioned east of the local kurkar ridge and upon its eastern slope. 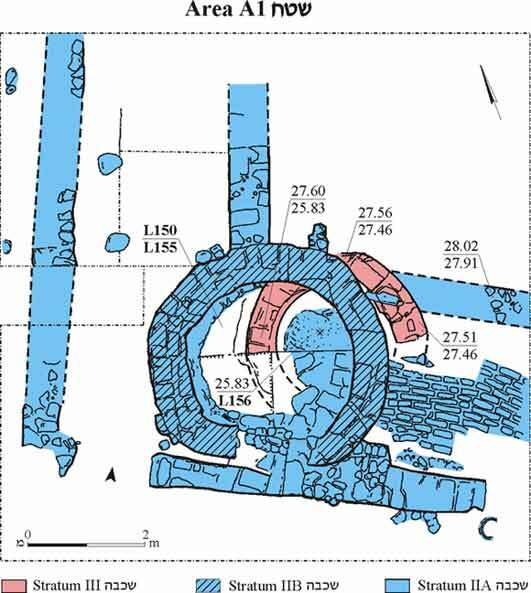 Consequently, six excavation areas (A–F) were opened where building remains were apparent (Fig. 1). 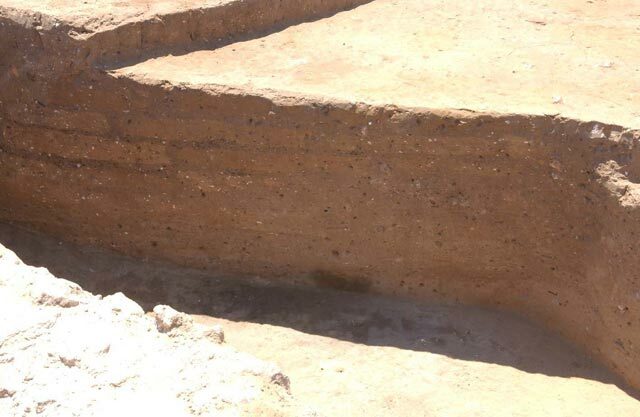 Preliminary excavation results indicate the existence of four primary strata, all of which may be dated to a very early stage of the Early Bronze Age I period. Stratum IV was defined in Area B within light brown and loose sands in the upper portion of an ancient sand dune. This occupation lacked architectural remains and was characterized by scattered finds. The absence of habitation buildup may indicate that this was an ephemeral human occupation, possibly a campsite. 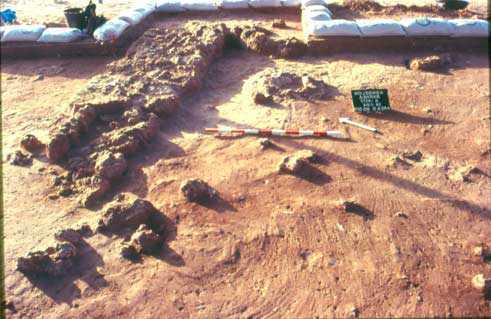 Stratum III was identified in most of the excavation areas. This stratum consisted of an intensive occupation upon the sand dune, including stone and mud-brick walls, alongside of pits dug into the sands. Stratum II was also identified in most of the excavation area and consisted of an intensive occupation that comprised large stone and mud-brick structures. Stratum I was, so far, defined primarily in Area B and contained post-occupation infant burials. Following the EB occupation, settlement was resumed only during the Byzantine period. 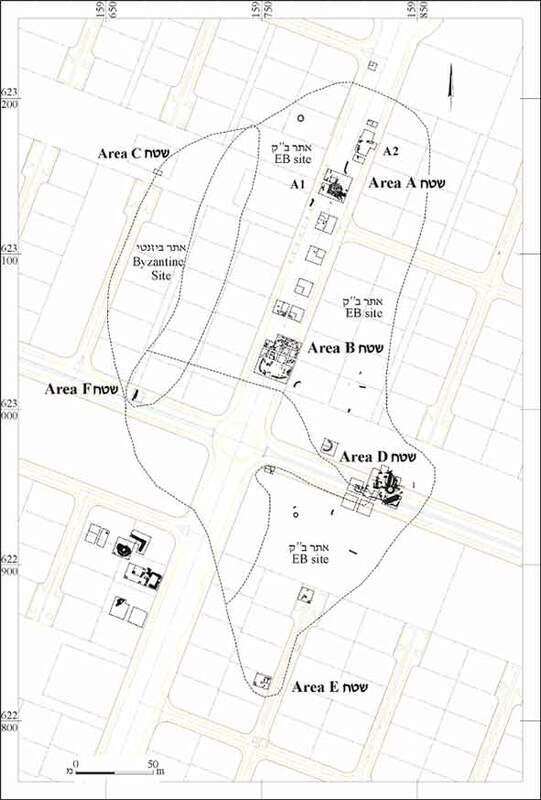 Positioned in the northern area of the site, this area comprised two clusters of excavation squares (A1 and A2), in addition to several trial squares positioned at set intervals along the roadway path (Fig. 1). 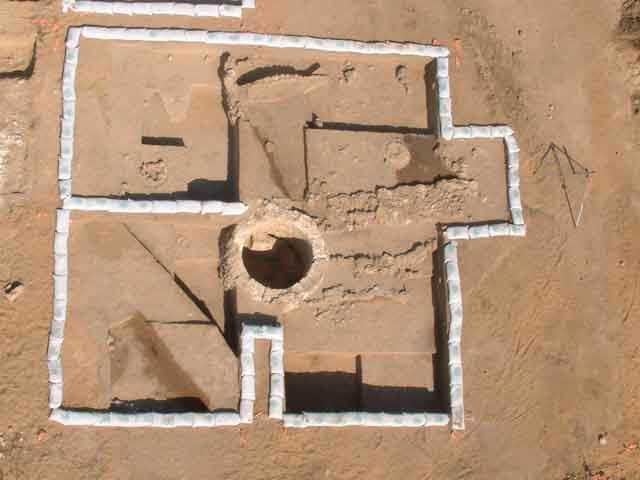 Two circular mud-brick structures, one atop the other, were revealed in Area A1 (Figs. 2, 3). The earlier structure, associated with Stratum III, was only partially exposed; it consisted of a silo dug 3.5 m into the sands and lined with a sloping wall of brown mud bricks (thickness 0.5 m). The silo was apparently coated with plaster on the inside, as evidenced by traces of a thick light gray layer on its lower portion. Directly upon this silo another, slightly larger circular mud-brick structure, associated with Stratum II, was erected. This structure was built of light gray mud bricks, preserved seven courses high. An entrance in the south led into the circular room, whose floor was paved with kurkar slabs and mud-brick fragments. At a later stage, this entrance was blocked up by stones and several stone and mud-brick walls were added on (Fig 3). Next to the wall of the Stratum II structure was a pavement of long and thin mud bricks. At this stage, the structure also appears to have functioned as a silo within a larger, multi-roomed building of unclear plan. Numerous carbonized olive stones and other seeds, as yet unidentified, were found within the silo. A portion of a large structure was revealed in Area A2, consisting of a curving wall built of small to medium-sized kurkar stones and traced for nearly 12 m. This wall was poorly preserved due to severe damage by later intrusions. 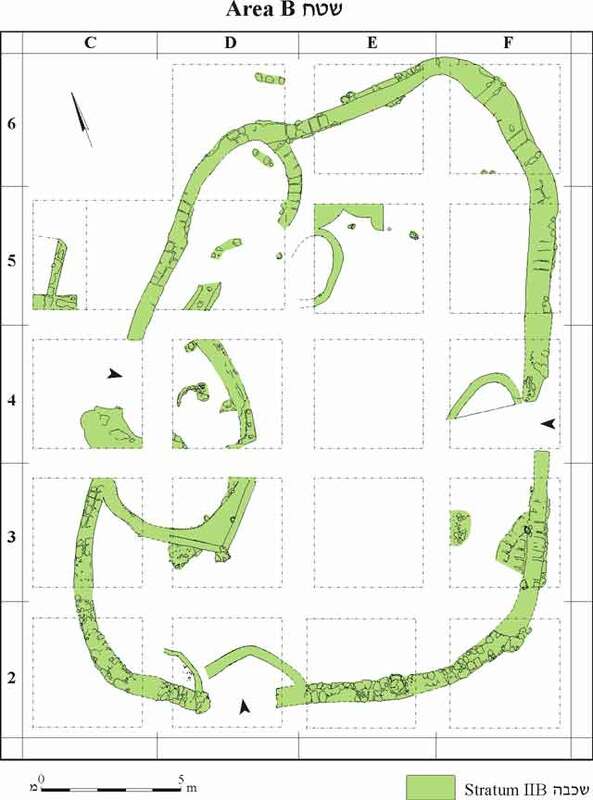 Positioned in the central area of the site, this area comprised one large cluster of excavation squares, in addition to several trial squares positioned at set intervals along the roadway path (Fig. 1). 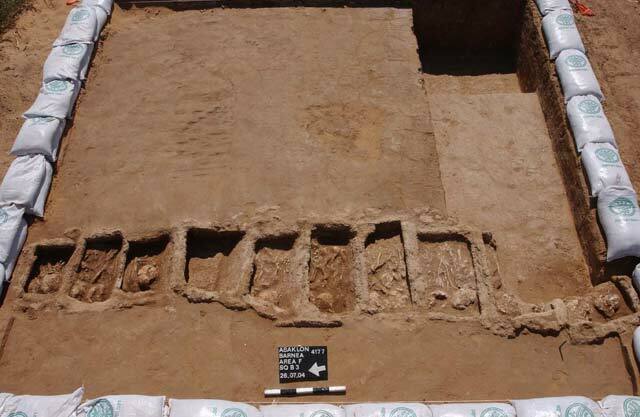 Four strata were identified within the main excavation area. Stratum IV, the earliest occupation upon the dune, was exposed in several limited probes, one of which revealed a thin ash layer in the sand. Stratum III consisted of a relatively thin occupational buildup upon several beaten-earth surfaces and a few randomly positioned circular and straight-sided pits, cut into the St. IV sands. One other pit was conical (diam. 1.9 m, depth 1.3 m). In the northern portion of the excavated area were several mud-brick walls of unclear plan. Trial squares to the north of the main excavated area showed the Stratum III occupational buildup to be much deeper than that exposed in the main excavated area. Stratum II comprised a large enclosure (c. 270 sq m), roughly oval shaped (15 × 22 m), bounded by a stone and mud-brick wall (Fig. 4). Only a few inner dividing walls were found within this enclosure, indicating that it was probably not roofed over. Two stages of use were identified for this structure. In the earliest stage (IIB) the enclosure was erected with three entrances: in the east, the south and west (Fig. 5). Within the eastern and southern entrances, thin and curving mud-brick walls that may have served to screen off visual contact from the outside were found. The entrance facing the sea to the west included an oval-shaped area (2.0 × 3.5 m) bounded by mud bricks. Several installations of burnt stones and numerous burned mud-brick fragments alongside of slag and crucible fragments indicate that this area was employed for copper melting. Remains of more copper melting installations were discovered in the northern portion of the enclosure. In the second phase of use, the enclosure continued to be used for copper melting as before, but with several minor architectural modifications, including the shaving away of most of the inner walls, which created a larger open space. Stratum I is defined as a post-habitation phase that comprised child or infant burials. Nine such burials were discerned, seven of them within store jars (Fig. 6). The other two were covered with large ceramic fragments set into the wall of the enclosure after it had gone out of use. No offerings were associated with any of these burials. This area comprised a small probe positioned on the western slope of the kurkar ridge (Fig. 1). The excavation revealed an occupational level that consisted of ceramic material with numerous Gaza store jar fragments from the Byzantine period (fifth–sixth centuries CE). Located in the eastern portion of the site (Fig. 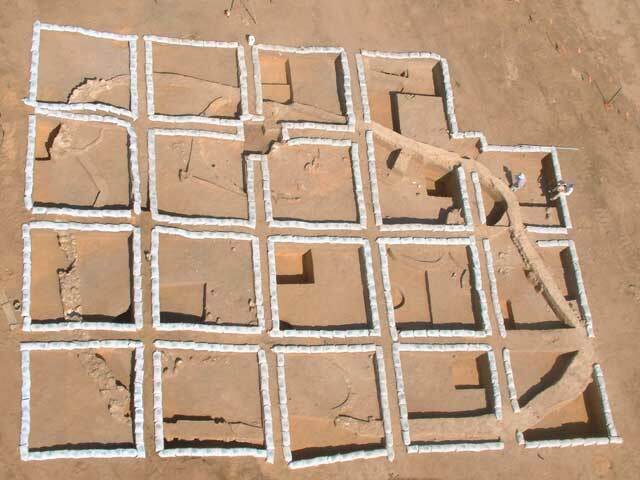 1), this area comprised one large cluster of excavation squares (Fig. 7), in addition to several solitary squares opened where architectural remains were visible. The main area revealed four occupational phases of the Early Bronze Age I, though it is still unclear to which of the general site strata these phases may correlate. The earliest phase (4) was identified in two limited probes as layers of debris atop the sand dune. A massive structure was constructed in Phase 3; only a single mud-brick wall (1.5 m wide) was preserved nine courses high (Fig. 8) and traced for 6 m, along with several beaten-earth floors. In the subsequent Phase 2, the areas adjacent to the wall were resurfaced and the wall continued in use, alongside of several stone and mud-brick walls of unclear plan found nearby. In the last occupation phase (1), this wall went out of use, while several stone and mud-brick walls of unclear plan (Fig. 9) indicate continued habitation in this area, though none of the architectural elements of Phase 2 continued into Phase 1. In the central portion of the excavated area, the remains of a well, constructed of rectangular ashlars, were found; this installation was not excavated down to the water table. Large amounts of debris, including architectural fragments and typical Gaza store jars, indicate that this installation went out of use during the Byzantine period. Located at the southern extremity of the site, this area consisted of four trial squares, spread out at set intervals. Two of the squares revealed scanty remains of a single occupational level dating to the EB I, apparently at the fringes of the site, while the other squares were either barren or produced a few walls set into the sterile sands, probably of Byzantine date. Located at the western extremity of the site, this area was excavated as one square that contained a unique construction of ten rectangular burial cists, arranged in a north–south oriented row (Fig. 10). The cists (0.3 × 0.4–0.4 × 0.8 m; depth 0.30–0.35 m) were oriented east–west and built of kurkar slabs. 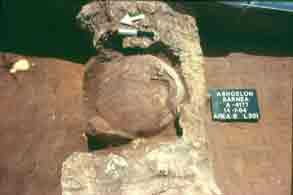 Each cist was paved and covered over with a kurkar slab. All the cists were dug into sterile soil and no other remains were identified above them, or in their immediate vicinity. Only secondary burials were found in the cists, all of them adult males, with the skulls positioned at the western end, facing the sea (Fig. 11). 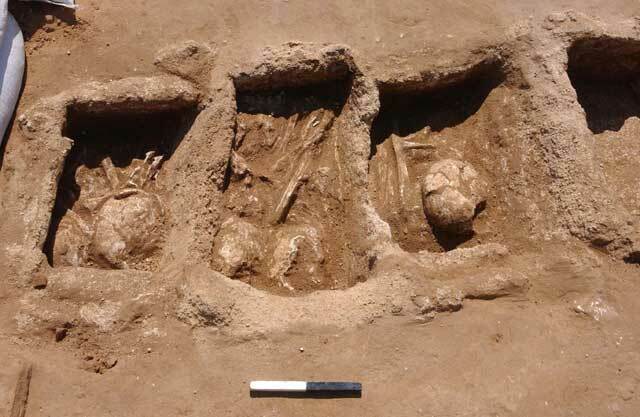 Except for one cist that was empty of osteological remains, between one and three burials existed in each cist, not accompanied with any grave goods. The lack of datable finds and the unique nature of these burials preclude their dating and cultural association. However, the finding of child burials from the EB period in Area B, located 45 m to the west may allude to a possible connection between the two. The present excavations are the first to explore the EB occupation at the site. The large silo in Area A1, the enclosure in Area B and remnants of the massive mud-brick wall in Area D l all appear to be remains of public buildings, which serve to highlight the importance of0 the site during this period. 1. Area of site and location of excavation areas. 2. Area A1, the two superimposed mud-brick silos. 3. Area A1, composite plan of Strata III–II. 4. Area B, the main excavated area. 5. Area B, the main excavated area. 6. Area B, a burial jar of Stratum I set into the Stratum II wall. 7. Area D, the main excavated area; note the large mud-brick wall at lower left corner. 8. Area D, mud-brick courses of the wide wall. 9. Area D, architectural remains of Phase 1. 10. Area F, a chain of burial cists. 11. Area F, close-up of burials within the cists.